c.1924: 12x12 frame cabin with roof platform. c.1930: 60-foot pole tower with a 7x7 cab. 1940: 40-foot pole tower with L-4 cab. 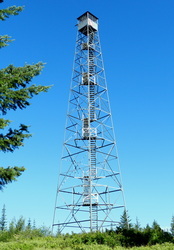 1931: 40-foot tower with L-6 cab, L-4 ground cab. 1934: The tower was burned in the Pete King Fire and not replaced. 1929: A gable roof cabin with a cupola was constructed. 1963: An R-6 cab was erected atop a 7-foot cinder block enclosed storage area. c.1934: 30-foot tower with L-4 cab. c.1939: 30-foot pole tower with L-4 cab. 1981: "The first time that this emergency lookout was ever manned was in 1937 when Ranger Millard Evenson was in charge of the district. That year William Pointer and a two man crew built a telephone line from End Butte out to Rhoda Point. The three men set their tent camp on the ridge near the point and on a boulder-strewn hilltop they built a 20-foot-high observation tower. A short distance from the tower they built a cabin of peeled logs with a split cedar shake roof. 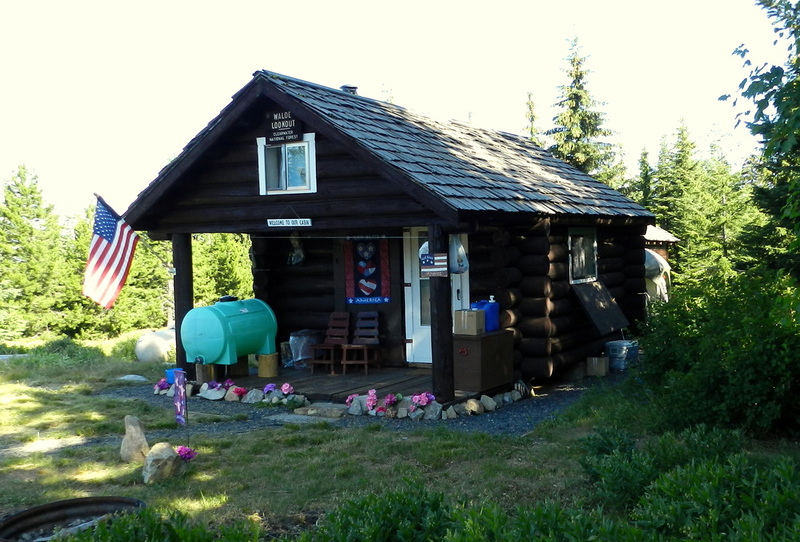 The cabin was only about 8x10 feet in size and was primarily for off-season storage of camp equipment to avoid packing everything back to the ranger station or horse camp cabin. It was also used for sleeping quarters by the lookout man. Cooking was done under a tent and fly out front. 1933: 50-foot tower with L-4 cab. 1987: The lookout tower was sold as surplus property and was moved to a private location. !931: A 75-foot tower with a 7x7 cab was erected. A ground cabin was built for living quarters. 1948: An L-4 cab was built atop a 40-foot treated timber tower. 1979: A 41-foot treated timber tower with an R-6 cab was constructed. 1958: A new R-6 cab was constructed on a cinder block base. September 3, 2008: The removal of the lookout was completed. Due to the use of lead based paint the contract for removal required special treatment and the ensuing costs were $19,835.00. 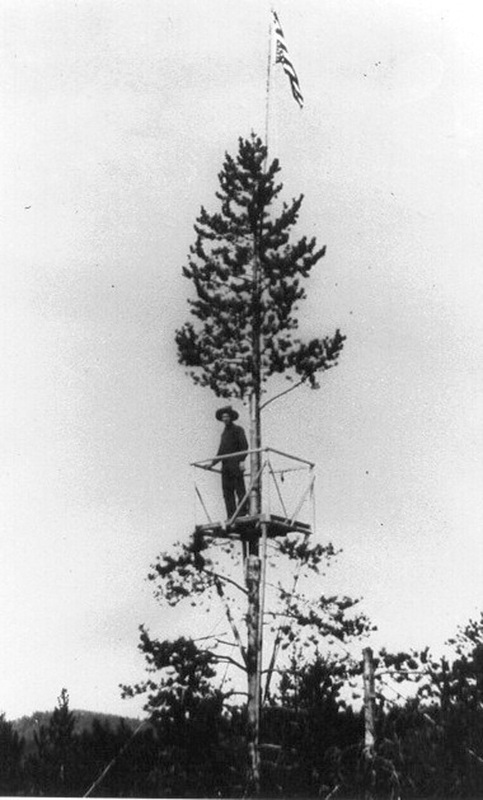 1931: A 30-foot timber tower with an L-4 cab constructed. 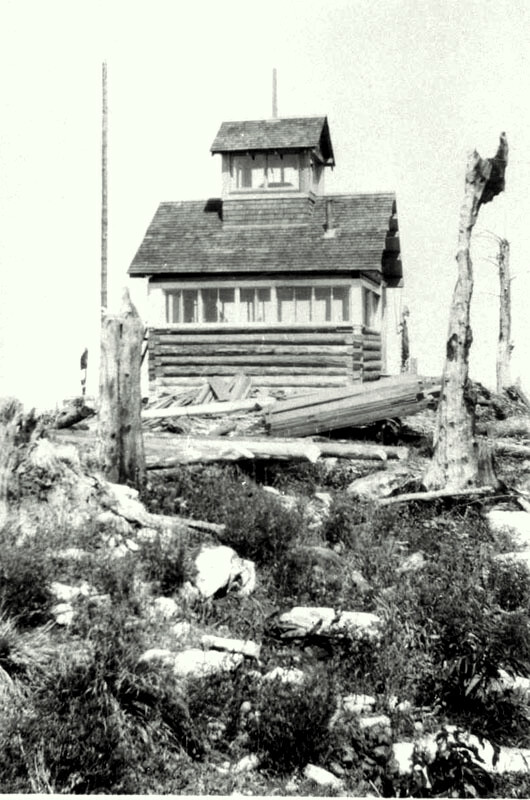 1934: The lookout was destroyed in the Pete King Fire and was never rebuilt. 1981: "Stanley was manned as a lookout point for the first in 1921 when Marion Strine and an unidentified companion were moved up there and set up housekeeping in a tent camp. In 1922, fire guards, including lookout Strine, built a 12' x 14' log cabin about 200' NW from the mountain top. A post on which to fit a Koch mapboard was wedged into the rock outcrop on the very top of the butte, in time a puncheon floor was laid around the post and a safety railing was installed. Lightning protection was added in the 1930's and later yet an Osborne firefinder replaced the Koch Board. The cabin eventually acquired a hardwood floor, ceiling and walls covered with shiplap lumber. Also installed were mouse-proof cabinets for storage- no more mouse droppings in food and dishes. In 1949 young Jim Mitchell manned the place for the last season. The cabin was condemned and burned in 1954." 1981: "Late in the 1925 fire season, Middlefork District Ranger Ray Ferguson sent firemen Earl Whitney and Russell Stadtman to Van Camp to man the point as a lookout for the remainder of the summer. The two men set their tent camp near a water supply in the first saddle north of Van Camp about 3/8 mile from the lookout point. They made regular morning and evening patrol trips to the point, except following lightning activity when more time was spent on lookout duty. When weather conditions permitted they brushed trail toward Middle Butte. Van Camp is not a prominent point, it is flat topped and was at that time covered with scattered, low growing brush with no trees to obstruct the view. The men had no mapboard or lookout map, if a smoke was spotted a smokechaser map was oriented flat on the ground and an azimuth bearing taken with a pocket compass. A photo taken in 1927 shows a lookout tree with a observation platform 50 feet or so above the ground." 1981: "A 100' steel tower with a glass-enclosed observatory at the top was built on the mountain by the Nezperce National Forest in 1939 at a cost of $5143.00. Material for the structure was hauled in either by way of Suttler Creek or Glenwood to Mystery Saddle, then over a newly built shoo-fly road to the top of the mountain. In 1941, a 14'x16' well built log cabin with a shake covered roof, that projected 6' over a plank floored porch, was built for lookout living quarters by the same forest at a cost of $219.00. The new cabin was located only a few feet from the steel tower. The point was transferred from Middlefork District to Lochsa District by a boundary change in 1956. 1981: "The point is located at the end of Trail #237, going in by way of Fish Creek. It was used as a lookout for the first time in 1929 when Ranger Ralph Hand, who was putting in his last season on Lochsa District, set a tent camp and one man on the ridge. For communication a telephone line was strung in from Obia cabin.